An inboard towboat is any fibreglass hulled boat that is powered by an inboard engine with a fixed shaft , propeller, and rudder for propulsion. Other common names for towboats are wakeboard boats, wakesurf boats, waterski boats, etc. 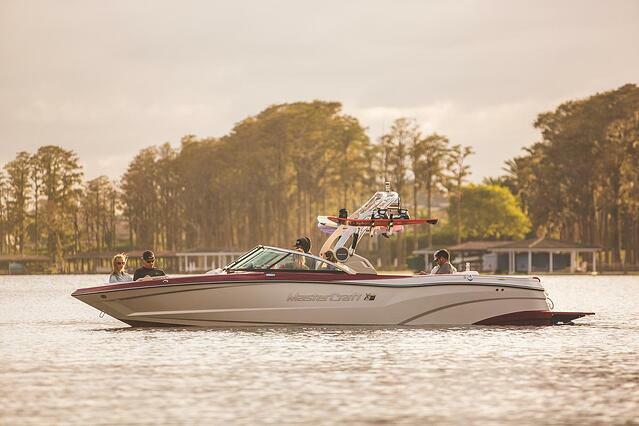 The main brands are Nautiques, Malibu, MasterCraft, Pavati, Axis, Tige, Centurion, Moomba, Supra, Supreme, and Heyday. There are many factors that go into towboat boat pricing. They include length, engine choice, brand, model, trim level, and options. Add to that, a variety of dealer differences ( how they choose to price their boats), dealer market location and exchange rates (as most boats are either built in the USA, or are indirectly linked to US$ prices through suppliers), and there are 1000 different ways a towboat can be priced. However, there are some basic guidelines that might help you decide if towboat ownership is for you and help you set a budget for buying a boat. For the purposes of this review, we will stay in the most common and popular size range of 20 to 25 feet in length. The "Surf Ready" Version has a Surf System (Ballast and devices), base engine, zero off speed control, trailer, and covers. The "Well Loaded" version include the same plus tower speakers, upgraded tower and board racks (if available), touch screen dash (if available), upgraded colours, and a number of popular next level options. As you can see, the purchase of a new towboat can be very affordable at the entry level. You also have a myriad of choices of brands and models that can bring you fun options, sizes, technology and luxury. Note that there are some towboat options that are less expensive, and also more expensive. This chart represents where the good quality brands end up in these popular categories and sizes. The above pricing does not include freight, pre-delivery, or any admin/licensing fees. For this article, I am focusing on new towboats. The used boats market is extremely strong, and finding good used ones is hard and they hold their value extremely well. Why is that? Primarily it is because a well build towboat that is taken care of can be used easily for 10-20-30+ years. Families are using them for many seasons before selling or trading them in. Usually it takes a major shift in technology or sport popularity to signal the need for an upgrade. That makes for a relatively low supply and as the towboat market is the fastest growing fibreglass boat segment, the demand keeps the prices high. 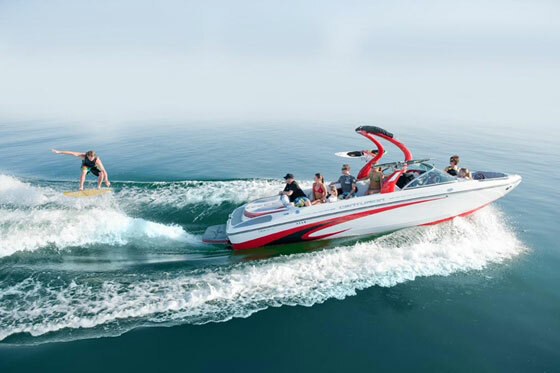 Many families want the ability to surf, wakeboard, tube, and cruise all in one package. Expect to see prices at 80-90% of new for 1-3 year old boats, 60-70% for 4-10 year old boats, and a remarkable 30-60% for 10-15 year old boats! Click here to see US Dollar used boat pricing on Nada. If you find a good used towboat and want to risk not having warranty likely, don't delay as they get snapped up fast. Also, recognize the value in the new with choice, warranty, condition, fuel economy, and lower maintenance and repairs. Remember that boat purchasing is more wisely looked at through the lens of cost ownership, vs. initial purchase price alone. Cost of ownership is defined simply as: initial purchase - what it is worth when you sell / how many years you own it + annual costs of fuel and upkeep. Although used boats almost always have a lower cost of ownership, it can be amazingly similar and with that slight premium you get a ton of value, peace of mind and satisfaction. I hope this view into the cost of purchasing a towboat has been helpful and if you want more information, please contact us directly, or check out the MasterCraft Boats resource page at this link here.